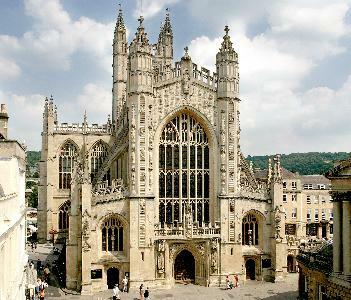 …in Bath was especially beautiful, and a sprinkling of rain made the pavements glisten. I loved it. Visited Bath Abbey – freshly restored a couple of years ago and stunning in its beauty, the glorious symmetry as you look upwards above the nave and chancel to the intricate carving soaring above…a plaque in the floor notes that the Queen came here in 1973 to mark 1,000 years of British monarchy, as the Saxon King Edgar was crowned on this site in 973 by St Dunstan and St Oswald.Useful notes on the history of the Abbey tell us that St Elphege was Abbot here in about 980. This interests me as I grew up in the parish of St Elphege in Wallington, Surrey, was baptised and married there: Elphege was an Archbishop of Canterbury and was martyred by the Danes at Greenwich. Bath Abbey is dedicated to Sts Peter and Paul.Bath is of course a Roman city and you can visit the original Roman Baths: all part of the same Roman Empire into which Christ was born and in which Peter became the first Pope…I gave talks to CathSoc meetings at theUniversity of Bath and at Bath Spa University, all organised by the excellent chaplain Fr Bill. He also runs a busy parish on the city’s outskirts, is hospital chaplain, active with the Ecumenical Society of the BVM, and more. The parish is dedicated toSts Peter and Paul. He is a Servite priest and strides around in full-length traditional habit and it’s really nice to see it on a modern University campus. …and I am here to speak at Prior Park College, and also at the Catholic Societies at Bath Spa and Bath Universities.Father Bill OSM, chaplain to both universities, is organising a lecture about Edward Elgar and the Dream of Gerontius on Monday Nov 12th – see the Chaplaincy website. If you don’t know about the story, you can get the basics from this link, and there is lots more on the Internet both in English and in German, but I’m keen to write a booklet about him and get, for example, the CTS to publish it. Bishop von Galen became known for his courageous sermons against the horrible Nazi euthanasia campaign – but of equal interest are his denunciations of the history books that children were being made to use in school, which sneered at the Church and the role of Christianity in history, and his concern at the immoral messages they were getting from various official youth schemes. He urged parents to counter this by teaching the Faith at home and remaining loyal to the Church. Er…if this begins to sound familiar, then you will see why I think his life and work have a message for today. … Verbum Domini, the new Papal document on the importance of the Scriptures. It is, obviously, centred on the Scriptures themselves, and also on the Second Vatican Council’s important document, Dei Verbum. This interests me very much, because this, almost more than other documents of Vatican II, has been central to our studies at Maryvale. Throughout the first half of my adult life, I was often told that the Second Vatican Council had produced nothing of real value, that it would one day be regarded as irrelevant, or that it had been a dreadful mistake. There had been so much post-conciliar muddle that it was easy to accepot this view (although I didn’t). Wiser voices, which urged the reading and study of the Council’s documents, tended to be drowned out – but when you could hear them, they gave good advice and now we are beginning to see the Council’s true fruits. Chief among these has of course been the Catechism of the Catholic Church – another crucial reference-point in Maryvale studies. But we can also note a fresh approach – a logical one, given the development of the Church’s doctrine in this area – to religious freedom and to the relationships between Christianity and other faiths. And the message offered by Benedict XVI on his recent visit to Britain – which proved so attractive, and which won over so many who had thought they were going to haye him – was soaked in the Vatican II approach…John Henry Newman knew that the Church needed an educated laity: people who could give a good account of what the Church taught and why. It is now a decade and a half since the “big exodus” in Britain of clergymen from Anglicanism to the Catholic Church. Today, you will find former Anglicans in all sorts of places in the Church—one is an auxiliary bishop in Westminster, another a monsignor, several are university chaplains, one is the director of a major Catholic charity, and another is a leading journalist and writer. When the Church of England voted in November 1992 to ordain women to the priesthood, it brought a major crisis to those who had always considered themselves, although Anglican, to be part of the wider Catholic Church. In the fifteen years that have elapsed since the Church of England’s General Synod decision, some 400 clergymen have left the Anglican communion to become Catholics. Not all have gone on to the priesthood—some are working in various fields, some Church-related, some not. In one case, a man returned to the Church of England and resumed his former ministry. Those who have become Catholic priests have brought considerable vigor, dedication, and commitment to the Church. These men were offered a special form of re-training which involved working part-time as lay assistants in parishes while attending a two-year program at a diocesan seminary. Ordination to the diaconate and the priesthood then followed. Pope John Paul II urged the English bishops to “be generous” in dealing with these men, recognizing that this was a crucial moment in British Church history. His advice was followed. Today, these men seem to have fitted into Catholic life in Britain as if into a seamless garment. Those who converted included five retired Anglican bishops, one of whom—Dr. Graham Leonard, the former Bishop of London—became a spokesman for many of the clergy. He is today a monsignor, and a patron of the “Path to Rome” conferences run by the Catholic Miles Jesumovement. The decision to leave the Anglican communion was not easy (although Anglican authorities noted the specific issues raised by the ordination of women and offered a special package of financial and other assistance in recognition of the years of service these men had given). “It was much harder for some men than for others” says Fr. Peter Edwards, now parish priest of St Joseph’s Catholic Church in New Malden, a London suburb. Of course for married men it often meant big sacrifices and risks—the loss of home, of a clear career path, and so on. But you cannot look back, and you have to trust God. The only moment that you can ever fully live is the present one. That is the only reality that exists for you and for which you can take responsibility, doing the right thing and trusting God to help you to do it. Fr. Peter was vicar of a church at Swanley in Kent, and he left the Church of England with both his curates and some 30 members of his congregation. He emphasizes that for each it was a personal decision—there was no dramatic farewell sermon or exhortation. The decision has to be based on truth and reality. Another who followed this path was the Rev. Alan Hopes, a London clergyman, whose curate Rev. Peter Wilson also made the decision. “I went to see my vicar, to tell him that I had made up my mind,” Fr. Wilson recalls. “And he told me that he was taking the same path!” Fr. Wilson is now Catholic chaplain at London University, running Newman House, a residence for students and center of Catholic activities. Rev. Alan Hopes went on to become a priest too. He was appointed parish priest in Chelsea—where the church is dedicated to the Holy Redeemer and St. Thomas More—and was then consecrated a bishop of the Diocese of Westminster, working with the Archbishop, Cardinal Cormac Murphy-O’Connor. Three of the converts with whom I spoke for this feature were named Peter—the third is Fr. Peter Geldard, now chaplain at the University of Kent at Canterbury. He had been the leading spokesman in the Church of England for those who opposed the move for women’s ordination, and in that capacity was prominent in all media debates, on the BBC, in the press, and on independent TV and radio stations. When he became a Catholic, all that stopped. He has no regrets at all. At Kent, Fr. Geldard is based at St. John Stone House—named after one of the English Martyrs, who during the Reformation maintained the Catholic faith and was executed for it. The chaplaincy is a rather ugly modern building, built in the 1970s and with a chapel which is bleak and rather small. But this is a busy chaplaincy, offering not only Mass and the sacraments for the students, but also talks, instruction in the faith, opportunities for community service, occasional retreats and pilgrimages, and a social life with other Catholics. A certain attention to liturgy and a commitment to doing things well seem to be trademarks of Anglican converts. There is a deep understanding that true Catholic liturgy is the work of God, not a showcase thing, and not something with which to tamper. “You don’t mess with the liturgy of the Church—it’s not our plaything” is how Fr. Peter Wilson puts it. He celebrates Mass with packed congregations in the too-small chapel at Newman House, and is in the throes of working on plans for a badly needed expansion of the chaplaincy. Meanwhile Canterbury Cathedral, headquarters of worldwide Anglicanism, welcomes millions of visitors each year. Pope John Paul came here in 1982 and prayed with the then-Archbishop of Canterbury, Dr. Robert Runcie, at the tomb of St. Thomas Becket. At that time, hopes for Anglican/Catholic reunion seemed high—but the move to ordain women meant that a certain dialogue simply ran into the ground. A common view on priesthood—and, as it turned out, on a number of other issues—was simply not present. Not all those who convert become priests. Neville Kyrke-Smith decided before the issue of women’s ordination had reached the Church of England’s General Synod. He had been curate at Littlemore—the church built by John Henry Newman in what was then a poor village just outside Oxford—and later vicar of a major Anglican shrine at Willesden in North London. Married, with a young family, he sought employment as a layman, eventually becoming director of the British section of Aid to the Church in Need, the international Catholic charity founded by Fr. Werenfried van Straaten, which helps Catholics in countries where they are persecuted. He had already, as an Anglican, been involved with helping churches in what was then the Communist bloc of countries in eastern Europe. His advice to anyone questioning the position of the Anglican Church—especially now that creation of women bishops has become an issue, and with acceptance of homosexual marriage on the horizon—is to look at things from a wide perspective. I still miss the music, some of the beautiful churches, and the dignified liturgies of the C. of E. But all that is external. The Catholic Church is “all glorious within.” The inner truth is carried, even if the external vessel is a bit leaky—and Benedict XVI is working on these issues now anyway. Another former clergyman who took a lay position is Dr. William Oddie, who went on to become editor of theCatholic Herald and a distinguished writer and broadcaster. Meanwhile, what of the Church of England? Long years ago, John Henry Newman, the most prominent convert of the 19th century, referred to it as a “bulwark against atheism.” This was true of Britain at the height of the Victorian era. Large numbers attended church, and belief in God was at the core of attitudes conveyed in school and home. But this is no longer the case. Today, church attendance in Britain is a minority activity. Catholics now outnumber Anglicans in terms of those actually attending on Sundays—although this is due in no small measure to the recent surge in Polish immigration. Other denominations—notably the growing “Black churches” with African and West Indian members—are also of importance. But most people in Britain attend no form of Christian worship. In many cities Islam is a dominant religion, with mosques a notable feature of the landscape, and Islamic dress a normal part of life in the streets and shops. The Church of England still lays claim to the historic creeds, and—especially in some Evangelical parishes—shows evidence of life and dedication. Young people gather to pray, and baptisms and confirmations are held. In addition, the ancient cathedrals still ring with the beautiful sound of Anglican choirs, people go to church at Christmas and Easter, and major royal events are still marked with church services. But how long can this last? In cities, old churches are now too large for small congregations of faithful worshippers. Upkeep can be a massive headache: Leaking roofs admit rain, and vast interior spaces need to be heated at immense cost. In rural areas, caring for medieval buildings is a problem, even though they are cherished and loved. Regular maintenance can prove impossible where many inhabitants of the villages are second-home owners whose connection with the local church is nonexistent. Recent changes in the law enable weddings to take place at any officially registered place, so hotels, country clubs, and old castles have become popular venues. The role of the Church of England in “hatching, matching, and dispatching”—baptisms, weddings, and funerals—is fading from public consciousness. Funerals take place at crematoria which have interdenominational chapels for this purpose. Baptisms are neglected in favor of “naming ceremonies”—a new trend—with poetry, music, and a lavish party. In the face of all this, the Church of England seems ill-equipped to face the challenges. In the 1960s Bishop John Robinson published Honest to God, a book which appeared to question Christ’s divinity and provoked a nationwide debate. Today, even that seems mild, as the Anglican communion is rent by disputes over issues that were not open to question among Christians for centuries. The death of Pope John Paul and subsequent election of Pope Benedict dominated the media in Britain in the spring of 2005, prompting a letter to the editor of a national newspaper asking whether or not Britain was still a Protestant nation. The answer, of course, is that it is not. But neither is it Catholic. It could probably best be described as “post-Protestant,” with a deep-rooted Christian heritage. Schools are still expected to teach Christianity—although other religions must be taught as well—and pupils are meant to receive basic instruction in the events of the New Testament. Christmas and Easter are still marked by televised services from well-known cathedrals. The Archbishop of Canterbury is a recognized public figure whose speeches are reported and whose comments are sought on issues of the day. But can this last? It seems unlikely that there will be another major exodus from the Church of England. Those who, while opposing the ordination of women, remained in the Anglican communion, belong to “Forward in Faith” and have their own magazine,New Directions. There is talk of a “Third Province”—a non-geographical province in addition to the geographical ones of Canterbury and York—that would cater to traditionally minded Anglicans. These already have their own bishops, who perform ordinations and confirmations so that they do not have to be part of the structures involving women clergy, whose orders they do not accept as valid. The future looks confusing. If female bishops become the norm, will everyone accept the ministry of those ordained by such women? How will things work? And will there be any unity on other issues? There is no “Bible Belt” in Britain, and enthusiastic Evangelical Christianity, while it can be found, is not a dominant force in community or political life. Indeed, any public expression of it is often dismissed as “an American import.” However, there are courageous Evangelical campaigners, in groups such as the Christian Institute, which speaks out for Christian values in public life, and in the pro-life movement. Talk of the future also involves discussions about the British monarchy. What form will the next coronation take? Everyone hopes—and expects—that it will occur many years hence. But discussions focus on what form of religious life will prevail in Britain by that time. Will the coronation be a multi-faith service? An Anglican ceremony with members of other religions invited? Will a female Archbishop of Canterbury preside? Meanwhile the Catholic Church faces its own problems—similar to those in the rest of Europe and in America and Australia. We need more priests, a restoration of beauty and dignity to the liturgy, and better instruction in the faith in Catholic schools. We need bishops who will defend the Church’s teachings and call us all to courage in the face of an often brutal secularized culture. But one message which has emerged in Britain is that the Church has an ability to renew itself, that God brings new gifts when they are needed, and that we should trust him and seek to do, each day, what is right—and let him lead us on. Who Worships in the UK? In an April 2007 poll, 53 percent of adults in the UK surveyed identified themselves as Christian, while 6 percent identified themselves as non-Christian. The remainder of those surveyed claimed no religion. 32 percent (15.6 million) have never attended church. Joanna Bogle is an author, broadcaster, and journalist living in London with her husband, a lawyer. …The words of the Psalmist came into my head today as I read the headlines. The psalmist promises that, with the Lord as our shepherd, we need not fear…Today our country walked into the valley of the shadow of death. Parliament has voted that a family does not consist of a mother and father who transmit life to their children. It banned any statement that a family needs a father, and agreed that two lesbians who want a child can decide to have one using artificial means. It rejected calls to tighten up the abortion law even after hearing the descriptions of how children are dismembered as small perfectly-formed babies at 22 weeks. It passed legislation which treats a human person as something that can be used for a utilitarian purpose.If some one, in whatever civilisation replaces ours, writes about these days, those who passed this legislation will be treated with savagery. The evil that will result from what Parliament has now permitted is clear enough even at this stage – but it will generate more evil, and terrible things will be done.No civilisation has ever survived, let alone prospered, when it failed to understand that human beings are at the heart of it all, that human existence has a value. Nor can any civilisation work that is based on a lie: and everyone knows that it is a lie to pretend that human life is not generated through the union of a man and a woman, and that this creates a family. He’s a cheerful and friendly man with a warm smile. He’d probably describe himself as “ordinary.” Which would be exceptionally accurate, because that is absolutely and literally what he is. Msgr. Keith Newton is the new Ordinary of the Ordinariate of Our Lady of Walsingham. Msgr. Newton—born and brought up in Liverpool, a former bishop in the Church of England, and a man with much pastoral experience, including several years as a missionary in Africa—was appointed whenthe ordinariate was formed in January 2011. He was ordained a Catholic priest along with two fellow former Anglican bishops in a packed Westminster Cathedral on a day that opened a new chapter in Britain’s ecclesiastical history. Just in case you’ve somehow managed to miss or ignore the significance of the Ordinariate, here’s what it’s all about. Some 20 years ago—in November 1992, to be precise—the General Synod of the Church of England, voting in London, decided to ordain women as priests. This shattered any hopes for future formal unity with the Catholic Church. A number of Anglican clergy and laity left the Church of England and joined the Catholic Church. A substantial group, while sharing a conviction that the Church of England had no authority to ordain women, remained and formed themselves into a network of parishes for which eventually special provision was made. Three bishops were appointed to minister to them. Nicknamed “flying bishops,” they travelled the country to visit the various churches, ordain clergy, and preside at ceremonies. But the position was always precarious. For those who genuinely believed in apostolic succession, the crunch was going to come if and when the Church of England voted to create women bishops. When the Synod voted to do just that, a new situation arose. Back in 1992, the Anglican clergy who looked to Rome had a number of meetings during which they asked if it might be possible for them to have some form of arrangement in which elements of the Anglican heritage—specifically in liturgy and in associated customs and traditions—might be retained. It seemed achievable, but it was not to be, and eventually the various clergy made their own way individually to ordination in the Catholic Church. But one of those in Rome who had been central to the discussions was Cardinal Joseph Ratzinger, and by the time of the major Anglican vote on women bishops, he was pope. He listened to the new plea from the remaining Anglicans who now looked to Rome. He took hold of the situation with both hands and offered them a lifeline. 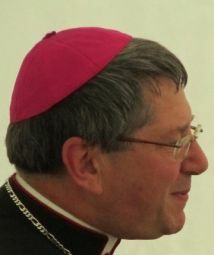 In October 2009, he issued Anglicanorum Coetibus, an invitation to Anglicans to enter the Catholic Church as parish groups, lay people together with their clergy, coming home to Rome and bringing with them all that they could of their liturgy, customs, heritage, and traditions hat would be compatible with the Catholic faith. The three “flying bishops” and a good number of clergy and laity responded. They made the decision to say a grateful “Yes” to the pope, and history began to happen. “It’s been quite an emotional time for people—in some cases people are leaving behind churches where they have worshipped all their lives,” said Msgr. Newton when I met him to talk about all of this. He was guest speaker at a conference of an international Catholic charity, Aid to the Church in Need—one of several groups that in recent months has been inviting him to come and talk and tell Catholics about the Ordinariate and future plans. The three “flying bishops” were united in their approach to Rome, and remain strongly linked as a team. He has a tough assignment. Some 60-70 former clergy elected to join the new Ordinariate, bringing with them varying numbers of laity from their parishes—the final tally seems to be something just over a thousand. Many of the clergy are married and some have young families. All will need housing. Some of the wives have jobs, but many don’t as they are busy raising the children at home. Initially, the new Ordinariate parishes will share facilities with local Catholics. Hopes that there might be possibilities for using Anglican churches have, so far, been in vain. Perhaps attitudes will change as the years go by, but Msgr. Newton is not relying on that. He is too busy with today’s practicalities. His duties are wide-ranging. “Essentially, the Ordinariate will function like a diocese—I will do everything that a bishop of a diocese does, except that I can’t ordain. So I will ask a bishop to do that.” He cannot be a bishop himself because he is married. The Newtons are a very united family: His wife entered the Catholic Church alongside him and was present at his ordination as a Catholic priest in Westminster Cathedral. The three wives of the three former Anglican bishops presented their husbands with vestments, in an unforgettable and moving scene, unique in the cathedral’s history. Later, one of the first acts of the newly ordained Fr. Newton was to baptize his first granddaughter. His daughter Lucy had become a Catholic some while before and is married to a Catholic. Their first child arrived, very opportunely, suitably in time for Grandpa’s ordination. Britain is in many ways a very secularized society, with churchgoing definitely a minority occupation. But the Anglican tradition has become part of the weave of British life—its hymns, its Harvest Festivals and candlelight carol services, its presence in people’s minds for baptisms and weddings and funerals. In the last two to three decades, that presence has been steadily less and less of a reality: Most weddings now take place at secular venues, baptizing babies is no longer the norm, and even funerals are not viewed as having to be Christian. The great hope could be that before the folk memory fades, the Ordinariate can capture the best of the old Anglican tradition and bring it alive—breathing into it fresh life and joy, the truth of the Catholic faith. That is a large project for whathas begun as a collection of small groups—but the Ordinariate will grow. The talk is now of the “second wave,” and the practicalities are the full-time job of Msgr. Newton and his team. Support from the wider Catholic community has not been lacking and there is a sense that, at a time when the Christian scene in Europe generally seems bleak, something is stirring in Britain. Watch and pray. Recently I visited Poland. I first visited Krakow back in the 1980s. Poland was under a Communist government then, and had been since the Second World War. But no one in the ruling government circles or in the bureaucracy believed in Marxism and the ordinary workers certainly didn’t. Everything seemed shabby and dreary — buildings with peeling paint, shops that didn’t have the things people needed. What a difference to return in 2012. You fly in to John Paul Airport, and it’s all gleaming and efficient. The city sparkles — it really is one of the most glorious in Europe and we loved sitting out in the evening sunshine in the main square, sipping coffee, with music and chatter all around, the pastel-fronted buildings, the fabulous baroque churches, the restaurants — it’s all wonderful. The young people with whom I was sharing the holiday felt very much at home. At the music academy, glorious sounds poured out from practice rooms as we mounted the stairs to enjoy a delicious (and cheap!) lunch on the roof terrace. At the Divine Mercy shrine we wrote our petitions on the sheets of paper provided, lit candles, voted the big ultramodern church architecturally uninspiring but impressive within, and squeezed into an extremely overcrowded Mass in the chapel where Sister Faustina first had her visions. What of Polish life and culture? Is this John Paul’s Poland, a land of strong faith? Well, the churches are full, and not just on Sundays. There was a lot of weekday activity too, much of it involving the young. The student church of St. Anna, serving the University, attracts lots of them: Masses, confessions, talks, pilgrimages, projects for those in need. There were young people coming and going on the weekday morning when we visited, a priest hearing confessions, people lighting candles and praying. The shrine of Divine Mercy had plenty of visitors. Children were visiting the cathedral in school groups. A Friday morning Mass at St. Mary’s in the main square was full. But don’t be misled, a professor from the university told me. The young know nothing of Communism, and Poland’s recent history is not of much interest to them. They enjoy life, they have their own worries about the future, and they are a bit tired of hearing about past struggles. Do they honor the memory of John Paul? Yes, he’s a national hero. And yes, they regard him as a great and holy person … but life moves on. Is Poland Catholic? Yes — and church attendance is high. But lower than in the years of Communism and the pressures from consumerism are huge. The Poles kept the faith in tough times in the 20th century: now they — and we — have to cherish it amid the new challenges of the 21st. And John Paul cannot be used to shore up a Church that fails to communicate the great truths to the young: it is fairly easy to create monuments and conference centers and museums in his honor, but these will merely be a burden to the Church if the central reality of the Faith is not there. Great popes have an impact that is different from the one that seemed to dominate within their own lifetimes. Saint Gregory the Great was famous for organizing substantial famine relief in Rome and the surrounding districts, and also for being an excellent administrator. Today we see him as important for his emphasis on the liturgy (Gregorian chant), and for his missionary efforts. John Paul’s role in the fall of Communism, even his superb teaching on the Theology of the Body, may in the longer term pale beside the giant legacy he left of a renewed emphasis on Christ and on prayer, his integration of the Marian dimension into our understanding of the Church, the hugeness of his missionary zeal, and the foundation of World Youth Day. Generations from now, children learning about the Rosary in school will get marks for knowing that the Luminous Mysteries were added at the end of the 20th century by the great John Paul, and sick people in hospital will draw comfort and inspiration from learning about how he served and struggled right to the end through a debilitating disease that finally robbed him of speech and facial movement. In Poland this year I learned again that each new chapter of the Christian story is exciting, and should be tackled with faith. I flew back to London with plenty to think about. John Paul opened up so many doors to Christ — now we must allow the Faith to surge through and bring light and hope. Joanna Bogle, a contributing editor of Voices, writes from London. She is a well-known author and journalist, who writes and lectures on issues of the Catholic faith, and appears frequently on the radio and television. …at schools around Britain, have sent in entries for the School RE Project launched jointly by the Catholic Truth Society and theAssociation of Catholic Women. This is awesome! The children were invited to write about Christ performing miracles, and were given specific instructions: they had to look up certain New Testament references and show an understanding of the events involved (they were given specific miracles to study, including Christ calming the storm at sea).Deadline for entries was yesterday, and sifting and judging is now taking place. We have two trophies to award, one for older children and one for younger, plus a large number of prizes and certificates. An initial sweep through a range of entries indicates that some are very good indeed – in fact, really touching and inspiring to read – some are poor, the vast majority show a grasp of Christ as God the Son and some one to be loved…I suspect that this must be the biggest single venture undertaken by any Catholic women’s organisation in Britain in recent years. We launched the RE Project a few years ago, and it has grown steadily. At first, we simply sent out brochures to schools, addressing hundreds of envelopes by hand. Then we got our website organised, and things grew a bit more. Then, this year, we decided to contact the CTS and see if they were interested…Next time some one tells you that everything in the Church is hopeless, all-going-downhill, everything-has-gone-wrong-since Vatican-II etc etc, read them the above. …study for my Maryvale degree, I’ve been reading Henri de Lubac, so when I saw a title by him in a friend’s bookcase I pounced. But it was something different – and I’m absolutely fascinated. It’s an account of activities in defence of human rights in wartime France – heroic stuff,meetings of underground groups, secretly-distributed newsletters, crucial papers eaten and swallowed by a priest friend while in a room awaiting interrogation from the Gestapo…Fr de Lubac was part of courageous group that wrote and distributed the secretly-printed Cahiers du Temoinage Chretien and his memoirs were published in the 1980s, by Ignatius Press, so that the events would not be forgotten: “Christian Resistance to Anti-Semitism: memories from 1940-44.” What emerges is the heroism of many in the Church in France – and also the shameful reality of the Petain regime.The latter, of course, had its apologists who hailed it as supporting Traditional Catholic France, opposing Communism etc… It helps to explain the situation of the Church in France, and tensions even up to the present day.It is interesting that de Lubac’s theology, which would later have a profound influence on many priests of the rising generation and at the Vatican Council opened by Blessed John XXIII, was forged not in comfortable libraries in easy circumstances but in the more poignant atmosphere of a nation where major issues of right and wrong – on which vulnerable lives depended – were crucial realities for every day. So things like justice,truth, the value of the Church with a consistent teaching , and the essence of a personal relationship with Christ, are all explored alongside brief accounts of difficult wartime communication and the tensions of various Resistance groups.Although much of the history was known to me, the theological insights are sparkling in freshness. A real find.